Esquire magazine recently crowned the Ryugyong Hotel the most hideous hotel in the history of mankind, apparently before visiting Las Vegas, none the less it makes you feel better about the hotel you are staying in. A picture doesn't lie -- the one-hundred-and-five-story Ryugyong Hotel is hideous, dominating the Pyongyang skyline like some twisted North Korean version of Cinderella's castle. Not that you would be able to tell from the official government photos of the North Korean capital -- the hotel is such an eyesore, the Communist regime routinely covers it up, airbrushing it to make it look like it's open -- or Photoshopping or cropping it out of pictures completely. Even by Communist standards, the 3,000-room hotel is hideously ugly, a series of three gray 328-foot long concrete wings shaped into a steep pyramid. With 75 degree sides that rise to an apex of 1,083 feet, the Hotel of Doom (also known as the Phantom Hotel and the Phantom Pyramid) isn't the just the worst designed building in the world -- it's the worst-built building, too. 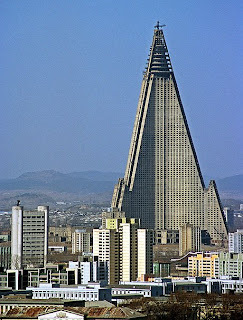 In 1987, Baikdoosan Architects and Engineers put its first shovel into the ground and more than twenty years later, after North Korea poured more than two percent of its gross domestic product to building this monster, the hotel remains unoccupied, unopened, and unfinished.